The Summer months have always represented a great time of the year to be out on the Scottish salmon rivers searching for one of these special creatures. Personally I always found June & July highly attractive due to the traditionally lower rod pressure on many Scottish salmon beats. At this time of year we always see consistent small runs of salmon entering the bigger Scottish rivers off every tide and especially the deeper Tay. These Summer runs have always been consistent as long as I can ever remember even if the rod pressure to survey them hasn't been. Sure I get the fact that anglers have been trained to book when there's fish being caught but given the nature of warm water running salmon they often don't hang about too long for that booking methodology to be effective. Anticipating these fish and making sure you're in front of the run always beats arriving too late! I personally prefer to be out on a salmon beat that's not fully booked where there are more hot spots to visit throughout the course of the fishing day when I'm fishing alone or guiding for guests. Getting in front of a hard running Summer salmon often involves visiting a few different potential stopping points multiple times over the course of the fishing day. 'Little and often' over these likely brief pausing areas will eventually coincide with the presence of a cooperating fish as long as you stick to the battle plan. Never assume in Summer salmon fishing that once a 'hot spot' has been covered then that's it done as at this time of year being in the 'right place at the right time' is often the winning formula. Although quieter Summer salmon fishing months June & July can be truly amazing if your timing and persistency levels are good. I recall a June day on the Tay a few years ago when a trout angler turned up on an 'introductory' guided salmon fishing gift voucher his wife bought him for Christmas. The pools I took him to on the middle Tay looked like they were empty until the fly started to swim! At 5 o'clock the guest turned to me and said he'd had a truly great day after catching 4 perfect fresh run salmon but he much preferred trout fishing as he found it more of a challenge! There are many other great memories of similar experiences in June & July I can also vividly recall. Make no mistake about the fact that good water coverage right now with a subtle and persistent small fly will get you in front of a fine Summer salmon on most of the bigger Scottish rivers. Don't be put off by the lack of rod pressure as that's no real measure (nor ever has been) as to the potential of a beat during these low water Summer months. Look for the areas of the salmon pools where running fish are likely to pause and work out a fishing plan where you can fish them multiple times. 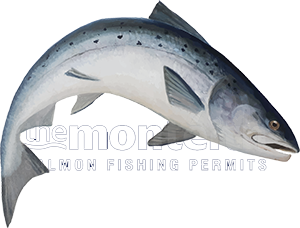 Don't deviate from that fishing plan and sooner or later and probably when you least expect it our Salmon God will likely cooperate!